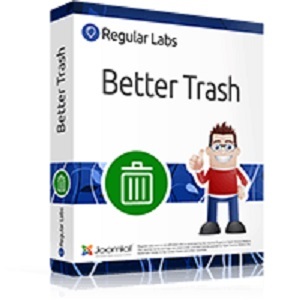 Better Trash - better trash management in Joomla! Better Trash improves the functionality of the default Trash button. Using Better Trash you will need less clicks to view and permanently delete trashed items. In Joomla, when you want to view the trashed items, you need to open the Search Tools and set the Status selection to Trashed. Then to delete all the trashed items, you need to select all items and click on the Empty Trash button. With Better Trash this becomes a lot simpler! Want to view the trashed items? Just click on the Trash button (without selecting any items). Want to delete all trashed items in that view? Just click on the Empty Trash button (without selecting any items).